Posted by peter88 from the Agriculture category at 24 Sep 2017 08:36:00 am. Seasoned do-it-yourselfers and mechanics know that DIY projects and working on cars and trucks can sometimes be messy business. While work stations can often be cleaned in a matter of minutes, grease and other stains on clothing can linger for some time, even remaining in the washing machine long after wash cycles have ended. Combating grease stains and their resulting odors has long been a problem for DIYers, auto mechanics and technicians. But there are ways to get the better of grease and even prevent future stains. • Act instantly. Allowing grease stains to linger on clothing can make them harder to remove. Professional mechanics and weekend DIYers should check their work gear for stains when they finish working for the day, immediately treating any areas that have been blemished by grease or other stains. The quicker such stains are treated, the less likely they are to set and become permanent. • Treat stains with specialized detergents. Ordinary laundry detergents may effectively combat everyday stains, but such products are often ineffective at treating the stains and grease that technicians’ work clothes are vulnerable to. Permatex®, a leading innovator in chemical technology for automotive maintenance and repair and the maker of Fast Orange® hand cleaners, has developed Fast Orange Grease X Mechanic’s Laundry Detergent (www.fastorangelaundry.com). 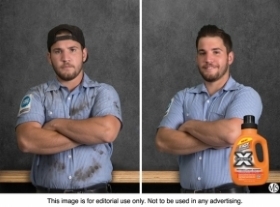 Designed to quickly and effectively remove grease, stains, tar, oil, automotive fluids, and odors from technicians’ work clothes, Fast Orange Grease X features a built-in pretreater that is powerful enough to remove up to 99 percent of automotive stains and odors. Ideal for professional mechanics and automotive hobbyists alike, this specially formulated detergent also disintegrates grease and soil as it cleans, ensuring no residual grease remains in the washing machine after each load. • Maintain a clean work area. Stains are a fact of life for mechanics, DIYers and hobbyists, but maintaining a clean, clutter-free work area can reduce the risk of accidents that lead to staining. Clean work areas at the end of each workday or DIY session, being sure to put all tools and gas cans away. • Take steps to prevent future stains. New projects tend to excite DIYers, mechanics and automotive hobbyists. But before diving into a new project, professionals and novices alike can take steps to prevent the stains that can form as they learn on the job. Research how to approach a new project to reduce the likelihood of accidental spills. Washing work clothes with Fast Orange Grease X can even make work clothes less vulnerable to future stains. “When formulating Fast Orange Grease X, we added a proprietary soil release/antistatic agent that repels future soil and stains,” said Permatex senior product manager Dan Clarke. Stains and spills come with the territory of automotive and DIY work. But mechanics and DIY enthusiasts can employ several strategies to get the better of grease and other stains.